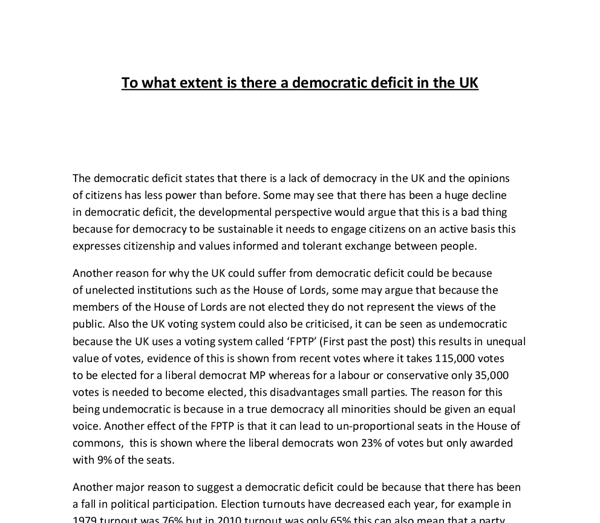 ﻿To what extent is there a democratic deficit in the UK The democratic deficit states that there is a lack of democracy in the UK and the opinions of citizens has less power than before. Some may see that there has been a huge decline in democratic deficit, the developmental perspective would argue that this is a bad thing because for democracy to be sustainable it needs to engage citizens on an active basis this expresses citizenship and values informed and tolerant exchange between people. Another reason for why the UK could suffer from democratic deficit could be because of unelected institutions such as the House of Lords, some may argue that because the members of the House of Lords are not elected they do not represent the views of the public. Also the UK voting system could also be criticised, it can be seen as undemocratic because the UK uses a voting system called ?FPTP? (First past the post) this results in unequal value of votes, evidence of this is shown from recent votes where it takes 115,000 votes to be elected for a ...read more. Those in marginal seats may be more likely to turn out and vote. Another reason for lack of participation could be because of political apathy where voters believe that they have made little difference or no influence to political situations, also hapathy suggests that a proportion of those who do not vote, prefer not to because they are satisfied with the way they are being governed. The electoral commission in 2005 showed that 29% of people who didn?t vote felt happy with the way they were being governed. Another reason for democratic deficit could be because some pressure groups with a higher status than others may have more direct influence than others, this is apparent with insider groups who have regular contact with decision makers and generally walk behind the scenes rather than engaging in publicity stunts for media attention to increase publicity. Inside groups include sectional groups who have a narrow sectional interest such as the BMA who are funded by the government. Whereas, outside groups have the disadvantage because they do not have regular contact with decision makers and may result in law breaking ...read more. This decision for devolution was done through a referendum, the referendum allowed people to answer a political question with a simple ?yes? or ?no? answer, this also would be seen as enhancing democracy as it allows the public to voice an opinion in a political matter, and it allowed the government to see what the public was in favour for. The transfer of west minister power to elected sub-national governments has allowed new legislations from these bodies, an example being Scottish and Welsh students having their university and tuition fees paid for. Some could see that subsidiarity would help enhance democracy as it allows the lowest tier of governments to engage in political decisions, this acts for local accountability making it more suitable for dealing with certain issues at a local level. In conclusion it is clear that the UK could suffer from certain impacts of democratic deficit such as unelected institutions, unfair voting systems and a decline in election turnout, however active participation such as pressure group membership and devolution are signals that the UK is becoming more democratic. ...read more. This student written piece of work is one of many that can be found in our AS and A Level United Kingdom section. 4 Stars - A strong essay. There is a clearly demonstrated understanding of the fundamental characteristics and arguments that define the concept of a democratic deficit. 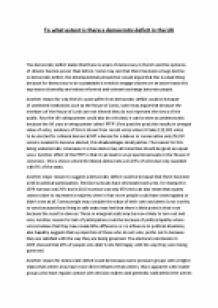 The essay is well structured into a balanced argument and largely makes good use of supporting evidence - though in places it is vague and generalised. To What Extent Is The UK Democratic? One example of when the Human Rights act was ignored was after the 07/05 London bombings where terror suspects civil liberties were restricted and were held in custody for longer than the permitted time. Most liberal democracies have written constitutions which ensure that conventions such as the human rights act must be complied with. Democracy controls government power It is a well-established belief that power tends to corrupt those who wield it. If those who govern us are left to their own devices, there is a danger that they will simply claim increasing amounts of power and begin to abuse their position. To what extent is Labour still a Socialist Party? To what extent are judges neutral and independent? overlaps between the executive and the judiciary as he is a major part of the government as well as the head of the courts system. This is a theoretical risk; he could technically manipulate judges, cases and appointments, however this is largely unlikely, as with appointments, any obvious bias or meddling would soon be uprooted and damage the government. To What Extent is conservatism an ideology? This would be that society could only flourish if it was free of government regulation. Conservatives are also usually empiricists. This means that they judge current actions against the experiences of the past. The conservative respect for tradition, pragmatism and suspicion of the new and untried are all aspects of this approach. To what extent is the UK a two-party system? How democratic is the UK political system? A two?party system is a system where two major political parties dominate voting in nearly all elections at every level of government. Some people have suggested that two-party systems promote centrism and encourage political parties to find common positions which appeal to wide swaths of the electorate. even though Sinn Fein believe it was promised to them in the St Andrew?s Agreement. However, it is not just the DUP that use Petition of Concern. The Northern Ireland Welfare Reform Act 2015 introduces a range of changes to the benefits system.